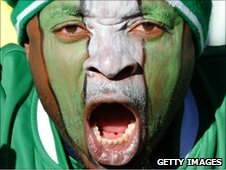 Nigeria will play Guinea this weekend after Fifa 'provisionally lifted' its suspension of the Nigerians. The Nigerian Football Federation (NFF) was banned on Monday for various reasons, including political interference. This had thrown Sunday's Nations Cup qualifier in Conakry into doubt. "The game will go ahead because the suspension on Nigeria has been provisionally lifted," Caf Media Director Suleiman Habuba told the BBC. Fifa said it lifted the suspension until 26 October - the day after a court hearing where the players' organization is expected to fulfil a promise to drop a lawsuit which sought to annul recent federation elections. "The decision was taken after observing that the situation had taken a positive turn in recent days," Fifa said in a statement. "However, should the NFF still be embroiled in court actions or any other issue preventing it from working freely on that date, the suspension will be automatically confirmed until all problems have been definitely solved." NFF secretary general Musa Amadu confirmed that the Super Eagles will travel to Guinea for the scheduled match in Conakry in Sunday following Fifa's 'magnanimous' decision. "We are happy that the ban has been lifted even if it is temporary," Amadu said. "It will allow us to continue with our programs unhindered." The qualifying match was hanging in the balance after Fifa imposed the suspension on Monday, preventing Nigerian teams and officials from taking part in international matches and meetings. Fifa rules protect its members' independence, and it said Nigerian officials had been compromised by government interference and legal action brought by the National Association of Nigerian Footballers. Fifa eased its stance after Amadu was reinstated on Tuesday as the federation's acting general secretary. He previously had been forced to step down on the instructions of the government-run National Sports Commission. Fifa also objected to the Nigerian sports minister starting the domestic league program without relegation from the previous season.